Listening to the radio to avoid traffic in the morning is part of many American’s daily grind as they head off to work. 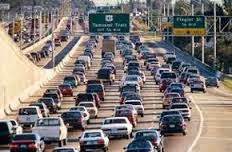 Sometimes if we are lucky we can avoid the latest accident related traffic jam by taking an alternate route (if we hear about it in time) but have you ever considered the fact that driving in some cities is much more risky than others? According to the latest statistics from the National Highway Traffic Safety Administration there are approximately 33,500 deaths each year on our roads. If you do the math that averages out to be approximately 92 people a day that lose their lives in vehicle accidents and to be honest that’s a lot less fatalities than I had previously thought. Still, I wonder if most of these accidents could have been avoided in some way. This year Allstate released their “America’s Best Drivers Report” based on claims made by their drivers in the nation’s 200 largest cities from 2011 – 2012. The report was very impressively done and considers other relevant data such as population density (based on U.S. Census Bureau statistics) and rain and snowfall data (based on information obtained from the National Oceanic and Atmospheric Administration) when comparing drivers in different areas. When all of this information is compiled it gives us a good idea of how cities compare to each other in regards to driver’s safety. Have you ever wondered how your city stacks up to other areas of the country? Below are the top 10 safest cities to drive in and the 10 most dangerous. Although this information is based on the results of only 1 major insurer it is a useful tool in determining where insurance rates might be a bit more expensive and why. 1. Ft. Collins, CO: Avg. years between accidents - 14.2 29.6% less likely to get in an accident as compared to the national average. 2. Brownsville, TX: Avg. years between accidents - 14.2 29.5% less likely to get in an accident. 3. Boise, ID: Avg. years between accidents - 14.0 28.4% less likely to get in an accident. 4. Kansas City, MO: Avg. years between accidents - 12.9 22.4% less likely to get in an accident. 5. Huntsville, AL: Avg. years between accidents - 12.6 20.3% less likely to get in an accident. 6. Montgomery, AL: Avg. years between accidents – 12.4 19.4% less likely to get in an accident. 7. Visalia, CA: Avg. years between accidents – 12.4 19.1% less likely to get in an accident. 8. Laredo, TX: Avg. years between accidents – 12.2 18.3% less likely to get in an accident. 9. Madison, WI: Avg. years between accidents - 12.2 17.8% less likely to get in an accident. 10 Olathe, KS: Avg. years between accidents – 12.1 17.5% less likely to get in an accident. 1. Worcester, MA: Avg. years between accidents – 4.3 134.8% more likely to get in an accident. 2. Boston, MA: Avg. years between accidents 4.4 129.9% more likely to get in an accident. 3. Washington, DC: Avg. years between accidents -5.1 97.3% more likely to get in an accident. 4. Springfield, MA: Avg. years between accidents - 5.4 85.8% more likely to get in an accident. 5. Providence, RI: Avg. years between accidents – 5.4 85.1% more likely to get in an accident. 6. Baltimore, MD: Avg. years between accidents – 5.4 84.9% more likely to get in an accident. 7. Glendale, CA: Avg. years between accidents – 5.8 72.6% more likely to get in an accident. 8 .Alexandria, VA: Avg. years between accidents - 5.9 68.2% more likely to get in an accident. 9. Philadelphia, PA: Avg. years between accidents – 6.2 61.2% more likely to get in an accident. 10. New Haven, CT: Avg. years between accidents – 6.3 59.1% more likely to get in an accident. For the complete list of all 200 cities, click here.